Heat oven to 350°F. Grease 13x9-inch (3-quart) glass baking dish. In large bowl, beat cake mix, water, oil and eggs with electric mixer on low speed about 30 seconds or until blended. Beat on medium speed 2 minutes, scraping bowl occasionally. Pour batter into baking dish. Bake 25 to 35 minutes or until toothpick inserted in center comes out clean. Before serving, in small bowl, beat 1 cup whipping cream until stiff peaks form. Spread over cold cake. Sprinkle with coconut and macadamia nuts. Cover and refrigerate any remaining cake. To toast coconut, spread on cookie sheet; bake in 350°F oven 7 to 8 minutes, stirring occasionally, until light golden brown. 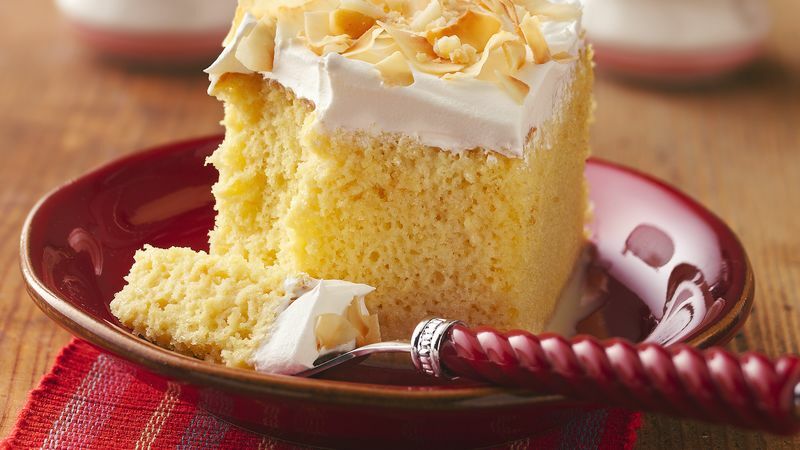 Tres Leches Cake is a classic Nicaraguan cake soaked with three forms of leches, or “milks.” It is a very moist cake and becomes more flavorful as it's stored. Refrigerate it tightly covered up to 3 days.